I’m the first person to say that I’m not a big fan of lawsuits. Full disclosure, I’ve been sued a few times now. That’s despite being the type of person who doesn’t cut the mattress tag off (even though you can). I’ve found that helping consumers by covering the same stories the news does (in the same way) tends to get me sued. Every lawyer representing me has said that I’ve done nothing wrong and no court has found that I’ve done anything wrong, but nonetheless anyone can be sued for anything. Wait this article isn’t about me. This article is about Equifax. By now you must be aware that Equifax had this huge data breach and some 143 million people’s information may be floating around for identity thieves to profit from. I think that last quote sums it up well. The only thing that I’d add is that none of us asked Equifax to have our data in the first place. I don’t think any of us could have opted-out. Even if we could opt-out, we probably would have realized consequences like it being difficult to get loans for homes, college, and cars – things that are fairly important. How many people will have their identity stolen because of this? There’s no way to know. What we do know is that 143 million people now have be on DEFCON 2 for the rest of their lives. I believe that Equifax should compensate people for their trouble and even the potential damage that could be caused. It doesn’t seem like Equifax is going to voluntarily offer compensation. From what I’ve been reading, it’s like pulling teeth just to get free credit freezes from them. An entrepreneur, Joshua Browder, created an online application awhile back that has won 375,000 court cases involving parking tickets. He’s modified it so that you can draw up the paperwork to sue Equifax in a couple of minutes. This Yahoo article has all the details. How much could you get? The maximum in small claims court varies from state to state. He says the average is between $10K-15K. My state is “only” $2500. I put “only” in quotes, because it’s still a large number. Will you get that money? I think it’s going to be unlikely, but I’ve been wrong before. Browder partnered with volunteer lawyers so there’s some credibility behind the idea. Is it fair for 143 million people to sue to Equifax in small claims court? I’m not sure that it is. However, the alternative is waiting for the class action settlement. Even if the settlement is for a billion dollars, which is HUGE, it would amount to $7 per person. I’m not sure it’s fair for people to get some small multiple of $7 either. Perhaps they have insurance, but I doubt they have insurance to cover something this large. One more thing worth mentioning, it seems (and I’m no legal expert) that you can still be part of the class action if you are persuing them at the local level as well. I’m going to give DoNotPay a shot. It may be unlikely to compensate me, but it is very, very low risk/effort and potentially with a large reward. What do you think? Are you going to try to sue Equifax in small claims court? No reputable blogger should ever have to add a category to their blog called “lawsuits.” Yet that’s what I’m doing with this post. Nubribullet, LLC is the owner of the well-known trademark and trade name Nutribullet. As you are no doubt aware, Nutribullet is a trademark used to identify products, services, activities and events related to Nutribullet, LLC. 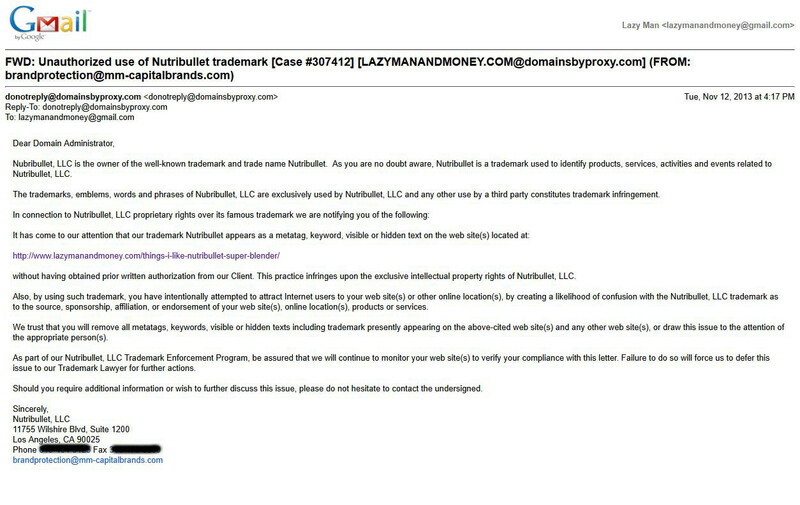 The trademarks, emblems, words and phrases of Nubribullet, LLC are exclusively used by Nutribullet, LLC and any other use by a third party constitutes trademark infringement. without having obtained prior written authorization from our Client. This practice infringes upon the exclusive intellectual property rights of Nutribullet, LLC. Also, by using such trademark, you have intentionally attempted to attract Internet users to your web site(s) or other online location(s), by creating a likelihood of confusion with the Nutribullet, LLC trademark as to the source, sponsorship, affiliation, or endorsement of your web site(s), online location(s), products or services. We trust that you will remove all metatags, keywords, visible or hidden texts including trademark presently appearing on the above-cited web site(s) and any other web site(s), or draw this issue to the attention of the appropriate person(s). As part of our Nutribullet, LLC Trademark Enforcement Program, be assured that we will continue to monitor your web site(s) to verify your compliance with this letter. Failure to do so will force us to defer this issue to our Trademark Lawyer for further actions. Should you require additional information or wish to further discuss this issue, please do not hesitate to contact the undersigned. You can see an image of this communication here. This email is fairly confusing on several levels. First, I wrote a pretty positive article concluding with, “So far, [NutriBullet is] like the Sodastream, a great product that worked its way into our lives and helped us be a little healthier than we would otherwise.” Second, I direct people to a place, Amazon.com, where they can by the product helping their sales. When I wrote a similar article about SodaStream (read review), including the trademark in the keywords, the employees of the company printed it out and shared it through the office. When I wrote about True Orange the company emailed me to thank me and asked if they could me send me free product. These companies get it. When you get good, free promotion, enjoy it and, if you want to be polite, thank the person for the help. The same logic applies here. There is no chance that someone would be mislead into thinking my site is the official NutriBullet website. That covers the “source” part of their complaint. As for “sponsorship, affiliation, or endorsement” I don’t see using a meta-keyword would convey that impression to users. I have yet to come across the Internet user who looks at meta keywords to determine if there is an affiliation. If such an Internet user did exist I could see how they’d be confused, because that simply isn’t what meta keywords are for. When MonaVie brought up the point, I thoroughly debunked their claim. The complaint also makes the point, “Also, by using such trademark, you have intentionally attempted to attract Internet users to your web site…” I use the NutriBullet trademark in the title of my article as well… and yes one could say that intentionally used it to attract Internet users to my web site. That’s an argument that at least makes sense as people read the title and then come to the site. By the time someone reads my meta-keywords on my site, they have already been attracted to my site (presumably by the title or someone else directing them to my site). Now there is a (poor) case to be made about search engines using meta keywords, which could also attract users to my site. However, years ago, Google declared, “Google does not use the keywords meta tag in web ranking.” Also there’s legal precedent: “the judge ruled that since the keyword META tags do not influence search results, having trademarked terms in them are immaterial.” So we can throw that out as a reasonable explanation for the letter… unless NutriBullet is unaware of the case law. Finally in any legal precedent that I can find about using trademarks in meta keywords, the complaints are from competitors. For example, it is reasonable to see how it can be misleading if VitaMix uses NutriBullet trademarked name on its site. However, no such case could be made as I’m not a competitor and I don’t even promote a competing product in the article. I wonder if Consumer Reports got a threatening letter for using the NutriBullet trademark in their review. Do you think that USA Today contacted Starbucks and Kraft about using their trademarks in the meta keywords before writing this new story this morning? I’m going to venture that they did not. I’m also going to venture that neither Kraft or Starbucks is going to threaten to sue USA Today for the article. (As a side note, I didn’t confuse the article to be sponsored or affiliated with either Kraft or Starbucks, did you?) I trust that USA Today and their legal team knows what they are doing is legal. Perhaps the saddest part here is that the letter isn’t coming from NutriBullet themselves. It’s coming from a company that is supposed to be representing their best interests. However, if I talked to NutriBullet’s public relations person, I doubt they’d say that sending legal threats to bloggers giving them positive reviews is in their best interest. It’s not a big deal for me to remove the keyword, but I don’t want to set a dangerous precedent. I don’t see where there is any infringement or confusion. As a service to readers I have a section at the end of every article that reads, “This post deals with: [Wordpress tags] … and focuses on: [Wordpress Category].” (Note: I should probably swap them.) The point of this is to aid readers who want to read similar articles on the topic. If I write multiple articles on NutriBullet as I have now, people can click on it and read all of them. The meta keywords are generated from these WordPress tags throughout my site and thus I would have specially code my site for this one article or take away the useful service to readers. P.S. NutriBullet, if you really didn’t want me to use your company’s trademarked term to attract visitors to my website, you shouldn’t send emails like this to bloggers. It’s pouring gasoline on the fire… and not in a good way. P.P.S. See what I did with the tags on this post ;-).